About 13,000 Alaskans signed up for health insurance on healthcare.gov during the open enrollment period that closed March 31st. The two insurers offering plans on the exchange in Alaska shared their enrollment figures today with APRN. Moda Health says it has about 7700 healthcare.gov enrollees in Alaska and the company is still processing some additional sign ups. April 15, 2014, only 67 percent of individuals and families that had selected a health plan in the federally facilitated marketplace had paid their first month’s premium and therefore completed the enrollment process. OK, let's unpeel this onion slowly, shall we? Through April 19, 70,243 people had signed up for Medicaid under the Affordable Care Act rollout, according to state figures, with federal dollars paying for about two-thirds of those people and state and federal dollars roughly splitting the cost for the other third, because they were already eligible before Obamacare entered the picture. There may be a few thousand more enrollments to come from Nevada, Colorado and so forth, but today, April 30, is about as definitive a date as we're gonna get for the wrap-up of the first Open Enrollment period under the Patient Protection and Affordable Care Act of 2010, otherwise known as the ACA or Obamacare. With that in mind, the time has come for me to officially declare my intentions for this website going forward. For the first time, low-income adults without children are eligible for government health coverage. In Illinois, officials expect that'll mean 350,000 new people in Medicaid. And that's not all. Julie Hamos, director of the Department of Health Care and Family Services, says the news reports and advertising and community outreach around the Obamacare deadline led to a separate spike. "We have 80,000 more than the usual enrollment of people who already were eligible, they just didn't sign up. But because of that activity in the communities, now they're signing up." The first article is mainly a breakdown of off-exchange QHP enrollments across various Blue Cross companies; normally this would be something of a jackpot for me, but since the BCBSA had already stated that they had over 1.7 million off-exchange enrollments not including March or April, these numbers don't really help out much. What I really need at this point are state-by-state off-exchange QHP numbers (ideally through at least the end of March), and I don't see those coming anytime soon. According to the Blue Cross and Blue Shield Association, between 80% and 85% of people who signed up for a Blues plan through a public exchange are paying their premiums. The percentage is based on a survey of member Blues plans as of Feb. 1. But individual Blues plans say that number is higher. Nevada has bumped their "started by 3/31" enrollment extension out until May 30. Colorado is allowing people up until May 31st to complete their enrollments, but only if they applied for Medicaid but had their eligibility denied. Massachusetts still has something like 270,000 people stuck in "Limbo Status" who may (?) have until June 30th to have their situations sorted out...not exactly sure what's going on with that, however. Read more about Michigan: ACA Medicaid expansion up to 159K in first 4 weeks! Guest Post: What Is All This "Deadline Creep" Really Telling Us? Recently, I've been puzzling over a question: what is all this "deadline creep" really telling us? Not just about the considerable burden it's placed on Charles Gaba in continuing this website, which is obviously no joke—but also about what's happening as the ACA rolls out. We've been watching deadline creep for at least a month now. And I think it's kind of a big deal. Read more about Guest Post: What Is All This "Deadline Creep" Really Telling Us? Read more about Idaho hits 76K QHPs, breaks own target by 90%! Less than 140K request ACA Mandate Exemption. Nationally. Remember all the fuss and bother that the GOP made about how no one would sign up for healthcare under the ACA for various reasons, ranging from the technical problems with the HC.gov website to the law making it "too easy" to get out of doing so (while simultaneously screaming about the mandate itself being "unconstitutional" even though the Supreme Court ruled that it isn't)? Well, the former has obviously not been an issue from the enrollment side for months (at least on the Federal side). As for the latter, guess what? The government left the door wide open for millions of Americans to be excused from the Affordable Care Act’s requirement that most people must carry health insurance or pay a fine, but so far relatively few have asked for such a pardon. About 77,000 families and individuals have requested exemptions from the health-care law’s so-called individual mandate, according to internal government documents obtained by The Washington Post. As of April 20, officials had approved tens of thousands of exemption requests and rejected none. Read more about Less than 140K request ACA Mandate Exemption. Nationally. Nearly 35,000 New Mexicans had enrolled in health plans through the state and federal insurance exchanges as of April 15, a 32 percent increase from the end of March, the New Mexico Health Insurance Exchange said Friday. As of March 31, 24,412 residents had enrolled through the exchanges, and as of April 15, that number had climbed to 34,966, as 8,554 residents took advantage of the extended enrollment period, NMHIX said. Combined enrollment in public and private plans now stands at 200,174, MNsure officials said. That includes 50,096 in private plans; 41,403 in MinnesotaCare, a public program for low to moderate incomes that requires a modest premium contribution; and 108,673 in Medical Assistance, Minnesota’s version of Medicaid. Pull the sheet over Cover Oregon; it's done. Oregon should pull the plug on the beleaguered Cover Oregon health insurance exchange and switch to the federal exchange, a technological advisory committee recommended Thursday. The move is considered almost certain to be adopted by the Cover Oregon board, which meets Friday. Changing to the federal exchange would cost about $5 million, while a partial fix to the Oregon exchange would cost more than $78 million based on an estimate from Deloitte, a Cover Oregon consultant. --First, residents of Oregon do still have 3 more days (today, tomorrow and Wednesday) to push their 2014 policy enrollments through the remnants of Cover Oregon, and I'm assuming that the current hobbled-together system will still be in place during the transition period for Qualifying Life Events, Medicaid enrollment and so forth. Read more about Pull the sheet over Cover Oregon; it's done. I haven't updated the graph with this yet, but both the front page "quick stats" block and the spreadsheet now include my rough guesstimate for the final mop-up period from 4/16 - 4/30...I'm guessing an extra 93,000 or so people are being tacked on via stray paper applications, special cases and oddball "super-extension periods" in Nevada, Oregon, DC and Hawaii, etc. this should bring the grand total through the end of April up to around 8.14 million, of which I expect AT LEAST 7.5 million to have paid their premiums by late May. Where the heck is the March HHS Report??? Of the pile of submissions and requests which piled up last week, at least a half-dozen were basically the same question: Where the hell is the official March HHS report? Obviously that report from Inside Health Policy claiming that they'd release the report back on the 17th, complete with early April data, was flat-out wrong. The irony is, of course, that a) no one has been anticipating this report more than myself (it was supposed to mark the end of this project, after all...although obviously the situation has changed...more on that later); b) I was previously concerned that they'd release the report too early (cutting off the last 2 days of March and only including 3/02 - 3/29); and c) it's actually just as well that they didn't release it last week, since I was in no position to do anything with the data anyway (still on the mend, but I'm at least able to type up a few updates this morning, as you can tell). Read more about Where the heck is the March HHS Report??? Michigan: ACA Medicaid expansion up to 140K in first 3 weeks! Read more about Michigan: ACA Medicaid expansion up to 140K in first 3 weeks! The state has previously reported that 147,000 people signed up for private health coverage, but said Wednesday that the total grew to 164,062 as officials finalized applications after the March 31 deadline. Open enrollment began last October. Updated enrollment numbers from Oct. 1 to March 31 are included below. Update as of 4/19: 45,291 Consumers have selected Qualified Health Plans, 32,365 have paid. This AR update is noteworthy for being the first enrollment update I've received which actually includes a reference to...myself! Through yesterday, almost 45,000 Arkansans have selected plans on the Arkansas Health Insurance Marketplace, the new marketplace created by Obamacare, according to information released today by the Arkansas Insurance Department (see county by county map above). Open enrollment is now closed, though people who submitted a paper application by April 7 have until the end of the month to enroll and pick a plan. We may also see this number creep up in the next few weeks as the carriers continue to receive data from the feds. Peter Lee, executive director of Covered California, said all 11 current health plans have indicated they plan to return next year. He also said three new plans have submitted letters of intent indicating they may compete on the exchange in 2015. How many updates can there be AFTER the extension period? Lots of people (especially myself) have been wondering just how many updates to enrollment data or other QHP/Medicaid/Exchange ACA-related news items there would be after the open enrollment "extension period" ended back on April 15th. After all, the dust should be settling with only the occasional bit of news now, right? Of course, some of these are duplicates and some may not really warrant their own full entry, but you get the picture. Seems like there's gonna be plenty of ACA news to keep this site operational for awhile yet. Read more about How many updates can there be AFTER the extension period? Read more about Kentucky: 82.8K QHPs, 330.6K Medicaid, 75% previously uninsured, ACA now covering 10% of all KY residents! Read more about Arkansas: "Private" Medicaid Expansion jumps to 155K...70% of total eligible! I'm back in action, baby! Well...sort of. UPDATE: Never mind. Yes, that's right...ACA Signups is back in action! Well...sort of. I'm able to post a couple of updates here and there, but don't expect anything major until next week. The swelling in my right eye has dropped significantly, allowing me to read and type for perhaps 20 minutes at a time, and I'm back on (semi) solid food...thick soups and the like. I also wanted to thank everyone for the well-wishes and words of support. And no, the irony of the situation is not lost on me: I'm taking my brand-new ACA-approved healthcare policy through a thorough workout this month, by subjecting myself to 3 different doctor's appointments (well, technically 4 if you include the dentist, but that's not covered by the policy, of course): Once to my GP, and two more to the Ophthalmologist (once last week to make sure the virus didn't infect my eyeball itself, and a follow-up next week to make sure it didn't seep into the eyeball later in the process). Read more about I'm back in action, baby! Well...sort of. UPDATE: Never mind. Not that this is particularly surprising after my prior post, but yes, I've been diagnosed with a nasty case of Shingles. That would be bad enough, but making it worse is that it's on my face (usually it's on the torso), meaning that my right eyelid is swollen over, making it very difficult to see, read or type more than a few sentences at a time. As a result, I probably won't be able to post any more updates at all for a few days, which will likely mean a bunch of them posted all at once this weekend (or whenever the swelling goes down). Please do keep sending updates in, however; I'll just flag them for later reference. Thanks, all. Talk to you when I can. ...no reason at all. Really. Shingles is most common in older adults and people who have weak immune systems because of stress, injury, certain medicines, or other reasons. Most people who get shingles will get better and will not get it again. Read more about You knew this was coming...now I'm sick. Read more about YES, you'll need to reset your HC.gov password. NO, this is no reason to freak out. • 52,156: Vermonters who used the Vermont Health Connect website, call center or navigators to shop for 2013 health insurance and now have coverage. • 24,888: Vermonters who purchased commercial coverage through Vermont Health Connect. • 27,268: Vermonters who shopped on Vermont Health Connect but qualified and are now enrolled in Medicaid. Eligibility expanded under the federal Affordable Care Act. • 33,549: Vermonters previously covered by the Vermont Health Access Program and Catamount Health who the state enrolled automatically in Medicaid based on income information on record. The S.C. Department of Insurance reported Friday that 114,789 individuals selected a plan on the federal exchange through April 15 - up from an 97,000 estimate earlier this month. A First: I'm gonna try to project the state-by-state 4/15 QHP totals! Today was filled with fantastic news across the board. The only bummer is that the actual HHS report for March (and the first half of April? ), with the state-by-state breakdown, was not released today. So, you know what? I'm so geeked about the 4/15 total actually breaking the big 8M mark after all that I'm going to attempt to estimate the state-by-state totals for every state which hasn't published their official 4/15 total yet myself. This may sound insane, but it's not as difficult as you may think (well, it's not difficult to do; that doesn't mean that I'll be accurate). First of all, I can obviously eliminate any state which has already released their data through 4/15. That gets rid of California, Colorado, Connecticut, DC, Minnesota, Nevada, New York and Oregon. I can also eliminated Washington State, since they never participated in the expansion period (they may have a few hundred stragglers via "special case-by-case basis" but that should be about it. Read more about A First: I'm gonna try to project the state-by-state 4/15 QHP totals! Overall, Terrell said, the state has received 95,000 Medicaid applications via the federal ACA sign-up, representing 132,000 people, since October 2013. And that number is likely to grow. The number of people added to Medicaid/CHIP in NC thru 3/01 via the HC.gov site was 55,691, so this could potentially be a more than 2.3x increase, but they're noted as applications, so presumably some of them will be denied. Still impressive. A total of 208,301 Connecticut residents enrolled in health care coverage through the Access Health CT online marketplace as of Sunday, the quasi-public agency announced Thursday. The numbers reflect those who signed up before the March 31 deadline for open enrollment, plus 5,000 people who attempted to enroll by that date but encountered some difficulty, but were able to enroll over the last two weeks. “Over the past two weeks, our team has made follow up calls to each of those individuals to assist them through the enrollment process, and we have now completed all open enrollment applications,” Kevin Counihan, head of the agency created as the state’s response to the federal Affordable Care Act, said in a news release. Of the 208,301 enrollees, 78,713 enrolled with a private insurance carrier and 129,588 enrolled in Medicaid. Of the 78,713 residents who enrolled with a private insurance carrier, 78 percent received a tax subsidy and 22 percent did not. Oh, by the way: The "over 124K" press release issued on the 14th was a big part of the reason why I downshifted my total projection from the 7.9-8.0M range down to around 7.78M a few days back. I assumed that the only reason they would issue a number press release the day before the deadline would be if the enrollments were tapering off so much that there would only be a handful left to count on the final day. Obviously I was wrong; CO managed to add another 3K QHPs on the last day. Update as of 4/15: 44,468 consumers confirmed Qualified Health Plan selections through Nevada Health Link, 30,176 have paid. Hey FOX News: Here's a free graph for you to use! Read more about Hey FOX News: Here's a free graph for you to use! So, now that I have the data through at least 3/31 (and in most cases, through mid-April) for all 15 state-run exchanges, I can start to play with the statistics a bit. At the end of February (technically March 1st), the 15 state-run exchanges totalled 1,621,239 QHPs. As of 4/15, these add up to at least 2,564,005, or 58.1% higher. There's anywhere from 2-14 days missing from some of these, however (perhaps 30,000 total, for a total of around 2.59 million), so let's call it about a 60% increase since then. However, we also know that the total exchnage QHP enrollment figure is a minimum of 7.5 million, and almost certainly closer to 7.9 - 8.1 million. Let's assume the low end: 7.9M total. Read more about More California Details: 1.4M QHPs, 1.9M Medicaid, 85% paid & more! Just a reminder: Assuming that Inside Health Policy has it right, the official HHS report should be released sometime today and should include about 99% of the exchange QHP enrollment data through 4/15. In the past, they've usually released the monthly reports around the 11th or 12th of the following month. In this case they've obviously been delayed because of a) the insanity at the end of March and b) thankfully, they apparently want to squeeze in the first half of April as well (as you know, I was deeply concerned that they might lop off the last 2 days of the month and roll them over to an April report next month, which would cause no end of confusion among sloppy media outlets which can't take a glance at the calendar and do basic math). They generally release these reports around 4pm. I know this because there've been at least 2 cases where the conference call with Kathleen Sebelius started up right as I was waiting for my kid to get home from school, so we'll see if that holds true today as well. I would love to believe RAND's estimated 8.2 million increase in ESI between September and March but my experience in commissioning similar polls suggests to me that it is not real but due to an unanticipated side effect of the poll methodology. We know that there is a pretty large "churn" in insurance status. Some people will gain jobs with insurance, while others lose them. Some people retire, get sick, or die. But one would expect the number gaining and losing employer coverage would be about equal. RAND's 8.2 million increase is the difference between 14.5 million estimated to have gained employer sponsored insurance and 6.3 million estimated to have lost it (with an estimated 102.4 million having employer coverage in both polls). Yesterday I posted a poll asking whether people found the term "woodworker" (used to describe new Medicaid enrollees who were already eligible to be enrolled even without the expansion provisions of the ACA) to be offensive. The thinking is that "woodworker" makes it sound like you're an insect creeping around under the floorboards and so forth; not the prettiest image. Texas: Baker Institute Survey suggests 760K exchange QHPs as of 3/15...NOT including kids! I'm debating whether to actually plug this number into the spreadsheet or not. On the one hand, I'm reluctant to do so without hard official numbers being given (this is just a survey, only runs through mid-March and doesn't include kids anyway). On the other hand, doing so wouldn't change my total projection of around 7.78 million exchange QHPs; it just reduces the "unsorted" number at the bottom. Plus, I'm almost certain that the March HHS report is going to be released sometime tomorrow (Thursday) anyway, so if I'm wrong, it'll be easy enough to correct it at that point. Read more about Texas: Baker Institute Survey suggests 760K exchange QHPs as of 3/15...NOT including kids! HOUSTON (AP) — More than 177,000 Houston residents have signed up for health insurance through the federal marketplace, far exceeding expectations for the city. According to an email obtained by The Associated Press, as of April 5 177,825 Houston residents enrolled for insurance under President Barack Obama's signature law. The email was written by Marjorie McColl Petty, the regional director for the U.S. Department of Health and Human Services in Dallas. The expectation had been that 138,000 Houston residents would sign up. Petty told Houston officials the numbers reflect a successful 13-county regional effort. The exchange had 699 people enroll for coverage in the two weeks after open enrollment was originally supposed to close, with 22 percent of those signups coming on Tuesday, the final possible day. That brings the total number of private health coverage enrollments to 10,630, Medicaid signups to 19,217, and small business enrollments to 13,118. Read more about Gallup Poll buries the lede: Uninsured down to 12.9% in first half of April! Even without expanding eligibility for Indiana Medicaid, the program had enrolled 40,577 more Hoosiers as of March than it had in the same month last year. More than 15,000 of that year-over-year increase occurred in March alone this year, as a flood of people here and nationally sought coverage before Obamacare would hit them with a tax for going uninsured. If you take a look at the Medicaid Spreadsheet, you'll see that I currently have the "woodworker" tally for Indiana at 40,951...only 374 more than the number reported above. That 40,951 is 15% of the combined total number of new Medicaid enrollments for Indiana from both the HC.gov website as well as through traditional state Medicaid agency offices (273,005). OK, the various ACA exchanges are just messing with my head now. First, Nevada announced that they've extended their enrollment out to May 30 for those who started by March 31st. Then Oregon announced that they've extended full open enrollment out to April 30. Then I found out that anyone who submitted a paper application by April 7th in any of the 36 states run by HC.gov still have until April 30 to finish. Colorado, I've discovered, is allowing people who applied for Medicaid but were denied up until May 31st to finish their enrollment process. And, of course, Massachusetts has over 200K "Limbo Status" people who may (theoretically) get squared away as late as June 30. Late last night I learned that Hawaii has bumped their extension deadline out to April 30. Oh for the love of...(sigh) Look, I'm all for letting as many people as possible enroll in healthcare coverage, but even I admit that I'm getting awfully tired of having to change the final, FINAL deadline dates. The Hawaii Health Connector has extended the initial grace period— which would have ended on Tuesday — given to individuals in need of extra time completing the enrollment application process for health insurance by a couple of weeks to April 30. Let's just hope they resolve their Heartbleed issue. This doesn't change the actual total number of Rhode Island's Medicaid expansion numbers, but it does specify the ratio between "strict expansion" and the "woodworker" enrollees...66% to 34%. Interestingly, this is virtually identical to the Washington State ratio (again, 67% to 33%). This isn't enough to apply to the other expansion states yet, but if it does prove to be the case, that should be helpful in figuring out how accurate my current estimates are. I currently have "strict expansion" at roughly 3.7 million, while "woodworkers" are at 2.05 million. A strict 67/33 ratio would have the "woodworker" number at around 1.82 million...except that the non-expansion states also have some woodworkers as well, which should account for the additional 230K or so. Figures obtained from the Chafee administration by WPRI.com show that out of the 64,590 Rhode Islanders who signed up for Medicaid from October through March using the state’s new HealthSource RI marketplace, 34% were eligible before the new law expanded the rules for who could sign up. A few days ago, Michigan's newly-expanded Medicaid tally sat at around 32,000, plus another 54,000 people transferred into the program from an existing state-run one, for a total of about 86,000 people. • Updated every Tuesday at 3 p.m. I've been shouting from the rooftops about OFF-exchange QHPs for months now (I first added a column for them on January 3rd and had my first significant data update on January 31st), and until recently few in the news media seemed to catch on to the significance of these. Until a few weeks ago, I had only officially documented about 560,000 off-exchange QHPs, but guestimated that there were easily 4 million or more out there (I had mused off-handedly back in mid-February that the total could potentially be 7.7 million, but decided to backtrack to "4M or more" out of caution). An estimated 107,000 New Mexicans have enrolled in Medicaid since the state expanded the qualifications in October to include low-income adults, state Human Services Department spokesman Matt Kennicott said Monday. ...A total of 26,412 New Mexicans had enrolled in health plans through the state insurance exchange by the March 31 enrollment deadline, the state office of the Superintendent of Insurance said in a news release issued recently. ...An additional 10,000 applications had been submitted by the deadline but remained unprocessed, the statement said. That's right. Thanks to high winds and a mid-April snowfall, I have no electricity today. Expect updates to be few and far between. Predatory Pricing Denied: HHS may require some companies to RAISE premiums (with good reason)? I've been debating whether to post about this since frankly, I'm not entirely sure that I have all the details straight about how this works. If anyone more familiar with this process wants to correct or clarify my description in the comments, please feel free to do so. OK, so there's all sorts of hand wringing over how much premium rates will increase for 2015 based on the 2014 risk pool. The CBO issued a report yesterday which projects that in spite of all the fretting, the overall average increase will only be a few percent, which is good news if true (although this will no doubt vary from state to state). However, I recently learned a couple of very interesting things about how the ACA works when it comes to pricing oversight and the "risk corridor" program. Read more about Predatory Pricing Denied: HHS may require some companies to RAISE premiums (with good reason)? Yesterday I issued a reminder/warning that the March HHS report might stop at 3/29, leaving the last 2 (and by far the busiest) days of the official enrollment period, the 30th-31st to be moved over to the April report. If HHS did this, the March report would appear to only include about 6.5M exchange QHPs, since another 600K would be moved to April, along with the additional 700K (give or take) enrollments from 4/01 - 4/15 (and even beyond). Fortunately, if this bulletin from Inside Health Policy is true, wiser heads at HHS have prevailed...and then some! Read more about BONUS: ACA causing INSURERS to proactively HELP people w/diabetes! The most expensive provisions of Obamacare will cost taxpayers about $100 billion less than expected, the Congressional Budget Office said Monday. CBO also said it doesn't expect big premium increases next year for insurance plans sold through the health care law's exchanges. In its latest analysis, CBO said the law's coverage provisions—a narrow part of the law that includes only certain policies—will cost the government $36 billion this year, which is $5 billion less than CBO's previous estimate. Over the next decade, the provisions will cost about $1.4 trillion—roughly $104 billion less than CBO last estimated. Monday's report also sheds some light on one of the big challenges still to come for Obamacare: next year's premiums. Some critics have warned that premiums could skyrocket next year, based in part on the demographics of the people who signed up for coverage this year. It took me a few minutes to figure out why, at this point, Colorado would issue a formal press release with a "final" number when there's still a day and a half to go. However, I realized that it probably simply means that practically everyone who qualified for the 4/15 extension has already done so by now; presumably they're already over 124K and there's only a few hundred partial applications left anyway, so their final tally will come in somewhere between 124K - 125K, thus allowing them to confidently release the news. On the down side, if this "winding down" effect is true in most other states, it also suggests that instead of one final mini-spike, the 4/15 deadline will actually result in a severe drop-off, making the final total more like 7.7M instead of 7.8M, but that's fine as well. In any event, CO is up another 3,000 exchange QHPs since last week to over 124K total. About 500 small employers participated in the Small Business Marketplace, or SHOP, which saw 220 enroll, covering 1,860 employees and family members. I did know that Florida was allowing paper applications received by April 7 to have their enrollments completed by April 30, but I thought that was it. The new federal deadline -- a special enrollment period – already allowed registrations delayed by exchange-related problems to be finished as late as April 30 for those who submitted a paper application by April 7. That extension applied to individuals living in states where insurance enrollment under the Affordable Care Act is conducted through the federal exchange. A few days ago I gave a final 4/15 exchange QHP estimate range from between 7.7 - 7.9M, with an outside shot of 8M. Today I'm narrowing my projection within that range; unless there's a really big absolute-last-minute spike today and tomorrow (which is conceivable), it's looking like the final tally will end up somewhere between 7.8 - 7.9M. 7.75 - 7.85M I suspect the 8M mark will remain tantilizingly out of reach. On the other hand, if I've seriously lowballed here and it does end up around, say, 7.95M, it's just barely possible that a handful of stragglers from Nevada and Oregon (along with paper applications in Florida?) could just barely drag the 4/30 total over the 8M line (Nevada has actually extended their "started by 3/31" policy all the way out until May 30, while Oregon has extended their full enrollment period out to 4/30). @charles_gaba off-topic? NJ had coverage 4 adult until age of 30-31? Do they go down to 26 under ACA and if so, did you account for that? The March HHS Enrollment Report may leave off March 30th and 31st, and therefore leave 600,000 exchange QHP enrollments to be tacked onto the April report instead. Earlier today a friend of mine (Eclectablog...who, by the way, is also the head of the best blogging team in America, and who could use your help with his quarterly fundraiser at the moment) noted that there was an anti-ACA banner ad from the Koch Bros running at the bottom of this site earlier today. His Tweet was intended as snark, of course, but at least a couple of people didn't appear to get the joke, and actually think this means I'm either hypocritical or some sort of 11th Dimensional Chess-playing Double Agent Mole working for the Koch Bros. Not sure how that would work, exactly, but whatever. OK, I actually do have one update today (it's 8:30 at night and my kid is getting ready for bed). When I first learned that Washington State's off-exchange total was a whopping 2.2x that of their exchange-based enrollments back on February 20th, I casually noted that if that held true nationally, it would make the off-exchange QHP tally easily 7.7M or higher ...and this was back when the exchange QHPs were only around 3.5M. However, I also tried to be cautious in my "official" estimate, keeping it to around 4M or so since I didn't know how many there really were beyond the 300K (later 560K) or so I had documented at the time. After all, other states would likely have a much lower ratio of Off- to On-exchange QHPs; In Wisconsin, for instance, Off-Exchange QHPs were only about 23% as high as exchange-based. Because sometimes you just want to take your kid to the zoo for the day. A few days ago, the much-discussed Rand Corporation healthcare coverage survey was released. There's a lot to absorb and discuss in it, but the one number which I found the most puzzling was their estimate of around 3.9 million private QHP enrollments via the ACA exchanges. As I noted at the time, this puzzled me because around "mid-March" (the point at which the vast bulk of survey responses had come in), the actual number of exchange QHPs was roughly 1 million higher, around 4.9M. The survey itself lists a +/- 1.1 million margin of error for that figure, but it still didn't make much sense to me, since the official HHS report through 3/01 (2 weeks earlier) was already 4.24 million. At first, I figured that perhaps they were lopping off about 20% to account for the unpaid enrollments. This would make the 3.9M figure correct, but there was no mention of payments in the survey. Maryland's press releases are getting shorter and more abrupt. With the enrollment period wrapping up and their exchange site still an utter mess (and about to be completely scrapped and replaced), this isn't terribly surprising. Still, this is up another 2,184 QHPs and 16,420 Medicaid enrollees in the past week, which isn't too bad, all things considered. Through April 9, 2014, 65,186 Marylanders have chosen to enroll in qualified health plans through Maryland Health Connection. As of April 8, 248,495 have gained Medicaid coverage in 2014 and remain active in Medicaid. Enrollments in qualified health plans since March 31 include 2,229 enrollments completed with assistance from a dedicated team responding to Marylanders who contacted our 1-800 hotline and other channels to request additional help. I think this is the first Nevada update I've posted which didn't come from the Nevada Health Link's Twitter feed. Technically only 28,208 have actually paid their first premium so far, but another 4,332 have scheduled their payment which is certainly a huge step ahead of having "enrolled but not even arranged for a payment" (and my model has 7% of this total being lopped out for potential non-payment anyway). So, 32,540 it is until further notice. And the number of people who enrolled in and paid for a qualified health plan through the exchange hit 28,208 on April 5, up from 25,899 people on March 31. Another 4,332 consumers have scheduled payments. Last week, that [the ACA being here to stay] sounded like wishful thinking. Two new studies released this week prove it. While the White House can claim credit for a net increase of 9.3 million insured and a lowered uninsured rate from 20.5 percent to 15.8 percent, the data provides a significantly different picture than that painted by President Obama and the ACA’s advocates. More than 106,000 Ohioans have signed up for Medicaid under an expansion of the taxpayer funded health program, while thousands of others are waiting to hear whether they are deemed eligible. ...Ohio's monthly report on Medicaid caseloads shows that 106,238 residents had enrolled under the extension as of March 31. That's about 29 percent of the roughly 366,000 newly eligible people estimated to sign up by the end of June 2015. More than 345,000 people have sought Medicaid coverage through the state's benefit site since Oct. 1. About 65 percent of the applications have been resolved, while roughly 120,000 are still pending. Many of those cases await eligibility determinations by the state's largest counties. Yesterday, contributor Stevef101 noted that Blue Cross of Idaho was bragging about enrolling 45K people via HC.gov...more than the total exchange QHPs for the state through the end of February. Today he further notes that the company has enrolled 70,000 people in new QHPs total during the enrollment period...meaning that 25K of them were done off-exchange. Six-thousand people responded to the program, and at last count, 70,000 Idahoans signed up for insurance during the first open enrollment period. "All of this publicity, people really starting to talk about what insurance can do for them, really made a big difference in getting people covered," said Zelda Geyer-Sylvia, President and CEO of Blue Cross of Idaho. Note that this doesn't change the high-end potential total of 7.8 million from the Rand Corp. study, it just fills in the documented number within that a bit further. The Graph, updated w/New Medicaid Category: "Bulk Transfers / Special Enrollments"
Read more about The Graph, updated w/New Medicaid Category: "Bulk Transfers / Special Enrollments"
About 3,500 Connecticut residents have enrolled in health insurance through the state’s health care exchange, Access Health CT, since the official open enrollment deadline passed on March 31. That’s in addition to the nearly 200,000 who enrolled by the health care deadline. Access Health CT CEO Kevin Counihan said there were roughly 10,000 people in the state who wanted to enroll but couldn’t complete the process by deadline for some reason. Those people were told to leave their contact information, and that the state would follow up with them to make sure their enrollment was completed. ...Customers to the state marketplace could either buy insurance through one of three private carriers on the exchange, or get covered through Medicaid. The majority of those covered through the exchange — more than 120,000 — were covered under Medicaid. About 45,000 people applied for health-insurance plans from Blue Cross of Idaho through the state's insurance exchange, Your Health Idaho, over the past six months. The insurer announced its enrollment numbers Thursday. Your Health Idaho is expected to release total enrollment for exchange plans soon. Open enrollment ended March 31. Four companies — Blue Cross, SelectHealth, PacificSource and the Regence BlueShield of Idaho sister company BridgeSpan — sold plans on the exchange. Additional note: 45K just happens to be my own "fair share of 7M" target for Idaho, so a single insurance company has hit the target. The other three are basically gravy. New Jersey FamilyCare has added over 100,000 people to its rolls, contributing to savings that Gov. Chris Christie has already anticipated in his proposed budget. In just the first three months of this year, 102,268 state residents were added to the rolls of FamilyCare, which includes recipients of two federally supported programs – Medicaid and the Children’s Health Insurance Program (CHIP). Through April 6, 41,402 Arkansans have purchased plans on the Arkansas Health Insurance Marketplace, the new marketplace created by Obamacare, according to information released yesterday by the Arkansas Insurance Department (see county by county map above). As in the rest of the country, Arkansas saw a surge in enrollment recently, with more than 7,800 people signing up in the last two weeks. But while national enrollment in the marketplaces across the country hit initial projections, Arkansas will fall well short. DOVER – Delaware ended its first enrollment period for the nation's new Obamacare health plans with 11,335 people enrolled – about 3,000 more than federal goals for the state. Another 3,411 people gained coverage through the state's expanded Medicaid coverage, which extended eligibility to 138 percent of the federal poverty level. Yeah, I know, I keep bouncing around on this; first I thought 8M was feasible, then I backtracked. However, let's do some simple math. Obviously it wasn't exactly 7.1M on the nose at midnight on 3/31. Let's assume an overage of, say, 20K at a minimum. It's also safe to assume that it was slightly over 7.5M as of midnight last night; let's say 20K there as well. I'd say a final weekend mini-surge is also likely for those who wait until the absolute last possible moment, which should cancel out what I'm assuming is a natural dropoff throughout the week. So...figure something like 30K/day today and tomorrow, then back up to 60K/day for the last 4 days. That's 300K added to the existing 7.52K, or 7.82M. Me, last night: Hey, Guess What? I think we just hit 7.5M QHPs. Health and Human Services Secretary Kathleen Sebelius says 7.5 million Americans have now signed up for health coverage under President Barack Obama's health care law. That's a 400,000 increase from the 7.1 million that Obama announced last week at the end of the law's open enrollment period. The figure exceeded expectations, a surprise election-year success for the law after a disastrous roll-out. Sebelius disclosed the new figure during a hearing Thursday before the Senate Finance Committee. Hey, Guess What? I think we just hit 7.5M QHPs. Note that I've modified The Graph a bit more tonight, separating out the ESIs (Employer-Supplied Insurance) into a 4th category (this includes the tiny number of SHOP enrollments, but mostly the controverisal 8.2M ESI estimate noted by the RAND study). Read more about Hey, Guess What? I think we just hit 7.5M QHPs. Read more about Connecticut: Up to 18K more QHPs even without official extension? Connect for Health Colorado reports that nearly 280,000 state residents gained coverage during the six-month enrollment period, including 120,971 who signed up for private insurance plans as of Monday and 158,521 who enrolled in the expanded Medicaid program as of April 1. In an interview last fall, Patty Fontneau, CEO of the non-profit organization running the exchange, had estimated that 125,000 to 140,000 Coloradans would sign up for insurance through the exchange during its first year. ST.PAUL, Minn. – Today, MNsure announced 181,357 Minnesotans have enrolled in quality, affordable coverage through MNsure, the state’s health insurance marketplace. The growing numbers come from continued processing of “in line” applications, as well as Medical Assistance and MinnesotaCare enrollments. ...To date, MNsure has enrolled 47,697 Minnesotans in a Qualified Health Plan, 37,050 in MinnesotaCare and 96,610 in Medical Assistance. Yesterday, however, the release of the RAND Corp. Survey made me realize that I was handling the 3rd category (OFF-Exchange Individual QHPs) the wrong way. You see, in the rare cases where I had access to the off-exchange enrollments for a particular company, I mushed their individual and group policies together. The numbers weren't huge--only about 34,000 people--but the potential numbers, as the RAND survey indicated, could potentially be massive. 700K to 1.3M Additional Medicaid Enrollees through March, If Current Trends Continue. However, March and April figures could bring more dramatic increases if outreach and enrollment efforts targeting the end of exchange open enrollment translate into new Medicaid enrollees. Specifically, if Medicaid sign-ups follow a similar pattern as exchanges, new Medicaid enrollees could reach 4.3 million by the end of March. In addition, recent figures released by CMS do not account for individuals assessed eligible for Medicaid through HealthCare.gov who have yet to be determined eligible by states. Programming Notes: Craig Fahle Show, America Tonight & Left Jab now online! For anyone interested, I'm scheduled to appear on the Craig Fahle Show tomorrow (Tuesday) morning at around 10:00am. The show is broadcast from WDET, 101.9 FM in Detroit. No idea what the rebroadcast schedule is but I assume it'll be available as a podcast archive at some point. Meanwhile, my appearance on Left Jab Radio on Sunday night, complete with my son bursting into the room in the middle of the broadcast, is now available via their website. My segment kicks in around 14:45 in and lasts about 20 minutes, I think. Read more about Programming Notes: Craig Fahle Show, America Tonight & Left Jab now online! Urban, Gallup, and RAND all say the number of uninsured is declining since the ACA went into effect. Now we can debate why and by how much. Everything else is secondary. Larry Levitt of the Kaiser Family Foundation wins the day. By our estimate, 3.9 million people are now covered through the state and federal marketplaces. This number is lower than current estimates of marketplace enrollment through the end of March from the Department of Health and Human Services (DHHS), perhaps because some of the HROS data were collected in early March. All HROS data collection reported here ended on March 28, and therefore missed the last three days of the open enrollment period, during which time there was a surge in enrollment. As noted earlier, the only way 3.9M makes sense to me is if they assumed an 80% Paid rate, which would have been about right at that time. Read more about The RAND Survey is out! Conclusion: NET insurance gain of 9.3M! The New Mexico Health Insurance Exchange (NMHIX) reported a total of 26,412 New Mexicans had enrolled in qualified health plans as of March 31, 2014, according to the Office of the Superintendent of Insurance. This figure represents a 76 percent growth rate from the 15,012 enrollments confirmed at the end of February 2014. Cruse said he became a full-fledged enrollee on a Moda plan in February. He’s now one of 59,000 people in Oregon who enrolled in private insurance after successfully navigating through the often cumbersome Cover Oregon process. Another 140,000 enrolled through the site on the Oregon Health Plan. UPDATE: OK, scratch that. Looks like this article was quoting the 58,833 "total" QHP figure from the most recent official press release instead of the "net" figure which was exactly 3K less: 55,833. Leaving this up since it's already posted but sorry about the mixup. The Department of Community Health says that as of 12 a.m. Monday, roughly 27,000 individuals had been enrolled in Healthy Michigan, which is intended to provide health insurance for hundreds of thousands more low-income adults. Nearly 100,000 South Carolinians enrolled in a health insurance policy on HealthCare.govbetween Oct. 1 and March 31, the director of the state's insurance department said Monday. But only some of those 97,387 individuals - about 57 percent - have paid their first month's premium, Director Ray Farmer said. The number of people actually enrolled may go up or down through May 1 - the deadline by which that first payment must be made. Data released Monday by the S.C. Department of Insurance shows a sharp increase in Obamacare enrollment in South Carolina during the second half of March. Approximately 30,000 people in this state signed up for a plan during the last two weeks of open enrollment. It's nice to be able to plug in SC's data, but the "How many have PAID???" thing is more amusing. 31% of the enrollees don't have their policy start until May 1st, so it's only 69% who you would even expect to have paid yet. Presumably the bulk of the 11% in between will pay over the next few weeks, and the 31% May-starts will start paying in increasing numbers as well. I'm not a private eye and I don't do corporate spying. I was recently contacted by someone representing one insurance company who wanted me to attempt to find out specialized enrollment data about one of their competitors. I don't blame them for giving this a shot; the insurance industry is, no doubt, a highly competitive business. However, get this straight: If you want inside info on one of your competitors, go elsewhere. If your competitor happens to provide enrollment data for me, the odds are that it will be published publicly, which means that you'll will be able to view it by simply visiting the website just like anyone else. As a courtesy, I am not going to identify either the person/company who made the request (nor the company they were trying to get information about). However, I cannot guarantee that I won't do so if this happens again. Read more about I'm not a private eye and I don't do corporate spying. 1. I don’t “hate” being compared to Nate Silver; It’s incredibly flattering. I just think it’s a bit of an insult to HIM. That isn't false modesty...I really don't know anything about "probability distribution" or "loglinear regression" (in fact, I had to look those terms up just now). 2. I didn’t expect HHS to release the full, 30-page report every week, I just figured they'd release the top-line numbers (X in QHPs, Y in Medicaid or whatever) on a weekly basis (and hope they decide to do so the next time around). 3. I didn’t know that Aaron Strauss was a data consultant or that he was in charge of the Analyst Institute; I figured he was a regular schmoe like myself. OK, so I may have gotten people's hopes up a bit too much with the 8M by 4/15 thing. Still, 7.6M or higher would still be awesome, and the two reports which were sent my way this AM should more than make up for my lowered projection. After hovering around 19% for years, hospital readmission rates began dropping beginning in 2012 and continued to do so into 2013. (The above chart reflects data through August of last year.) The national rate appears to still be falling considerably this year based on the latest data from the Centers for Medicare and Medicaid Services, or CMS. Readmissions cost U.S. taxpayers a pretty penny. The federal government estimated that hospital readmissions for just Medicare patients has historically added up to $26 billion annually -- $17 billion of which could be avoided. I don't have Sirius XM myself, but if anyone does, I'm scheduled to be a guest on "Left Jab" this evening, sometime between 7pm - 9pm. It's apparently on Channel 127. Anyway, for anyone interested, the podcast of the show should be available around 9:30pm Eastern or so. This breaks down to around 60K per day x 15 days, which is what I'll be tacking onto the Spreadsheet & Graph until the actual total comes out. Moving the Goal Posts: Now it's "How many of the UNINSURED have paid???" "OK, most people have paid, and a high percentage of the total may be newly insured after all...but how many of those who are newly insured have paid???" That's right, this is where they're trying to move the goal posts. Read more about Moving the Goal Posts: Now it's "How many of the UNINSURED have paid???" Hmmmmm...not sure what to make of this update out of KUNM in New Mexico. NM only had 18,691 exchange QHPs as of 3/15, so 51.4K would be absolutely insane (a 2.75x increase). It looks like they've mixed the SHOP enrollees into the mix, which means it's not quite that crazy--take those out and the QHPs are down to 37,400, or a "mere" doubling of the existing total. So...I guess that makes sense. HOWEVER, this causes bigger questions, because the only data I've had for New Mexico's SHOP exchange was a mere 524 as of March 18th. How the hell did they manage to enroll 28 times as many people in the next 13 days??? Updated @MNsure enrollment numbers: 47,046 QHPs, 35,603 in MinnesotaCare and 92,402 in MA. Total of 175,051. I don't usually write this all out, but given the interest in the site these days, I figured I would give a play-by-play of the process of breaking down the CMS reports by state, using the February CMS report just released an hour or so ago. Of that number, 42,320, or 65.5 percent, represent adults in Medicaid’s new eligibility group, adults 19-64 without dependent children who were not previously eligible for Medicaid but became eligible on January 1, 2014. The new eligibility group is authorized under the Affordable Care Act’s Medicaid expansion and is financed with 100 percent federal dollars for its first three years, 2014-2017. The other roughly one-third represents those enrolling who were eligible for Medicaid under previously existing rules. Unfortunately they don't specify how many of the remaining 22.5K are renewals vs. "woodworkers". I'm going to go with about half (11K, or around 17% of the 65K total) unless I receive further clarification one way or the other. This reduces the current "woodworker" estimate of 16.6K by about 5,600. OK, this one is actually semi-legitimate, depending on your perspective. According to Glenn Kessler of the WaPo, when the CBO crunches the numbers next year to see how many 2014 ACA Exchange QHPs actually did qualify as being counted towards their 7M (then 6M) projection, they're actually going to have to slice up every single person enrolled into 12ths. That is to say, if your policy started coverage in January and was paid for straight through until the end of the year, you'll be counted as one "CBO person", but if it didn't start coverage until, say, April 1st, you'd only be counted for 9 months, making you 3/4 of a "person" in CBO terms. Now topping more than 3 million, the number of Californians who have enrolled in a private health care plan or in Medi-Cal through the state's health insurance exchange will likely rise by about 500,000 people who started but did not finish their applications by Monday's midnight deadline, exchange officials said Thursday. At a news conference, Peter Lee, executive director of the Covered California exchange, told reporters that of the half-million individuals who had started their applications in the last week of March, at least 20,000 had finished their applications by Tuesday. Now, I'm assuming that "finished their applications" in this case actually means "enrolled", because 500K / 15 days = 33,333 per day if they plan on squeezing that many in under the new 4/15 wire. By popular request and much pondering (see comments at bottom of link), I am no longer subtracting the 3.7M Cancelled Policies from the grand total. However, these are still clearly and prominently noted in the yellow box. As promised, I have lowered the "Sub-26er" bottom-end estimate again, from a low of 2.2M to 1.6M. I'm done mucking around with this until further notice. With the official announcement of a whopping 1.7M OFF-exchange QHP enrollments from the BCBS Association, I have increased the documented off-exchange total to 2.17M on the graph, causing a noticable spike at the end (obviously these weren't all enrolled in today, but I can't really back-date these so they're all added at once). Note that I've also deleted all of the state-specific BCBS off-exchange QHPs since the 1.7M total noted above supercedes all of them. Since the 9M total off-exchange figure credited to the Rand Survey was a very rough estimate (see update at bottom of link), I've added an "up to" caveat (and the 6.83M balance isn't on the graph itself anyway). I've replaced the 7M arrow with 6M and 7M lines to reduce the clutter. Finally, the most controversial change is probably the removal of the "documented unpaid" exchange QHPs (as well as the "estimated additional" QHPs; instead, I've simplified things greatly by separating the total Exchange QHP number into 2 areas: 93% estimated PAID (or will pay soon) and 7% UNPAID (or may not pay). I'll be happy to revise this 93 / 7 ratio one way or the other as more data comes in, but for now, based on all the partial "Paid/Unpaid" data I've seen to date, that seems to be fairly accurate. About 5 different people have sent me a link to this new study by the Urban Institute, which concludes that the total number of uninsured adults in the U.S. has been reduced by around 5. million people since last fall. The Urban Institute's Health Reform Monitoring Survey (HRMS) has been tracking insurance coverage since the first quarter of 2013. Today, we report the first estimate of how the uninsurance rate has changed through early March 2014. These results track changes through most of the first Affordable Care Act's (ACA) open-enrollment period, which ended on March 31, 2014. As deaconblues reminds me, the 29K is in addition to the 720 subsidized enrollees that they've managed to get through their messed-up system. Massachusetts will not meet its goal of moving more than 200,000 people into insurance plans that comply with the federal law by the end of June. It has managed to enroll about 29,000 residents in unsubsidized coverage, 138,000 in temporary coverage, and another 114,000 in extended coverage since the October launch of its new website, with a significant number applying on paper, said a Connector spokesman Thursday. First, don’t believe polemicists who argue that 70% or more of buying policies at HealthCare.gov had insurance already, as Republicans claim, in an interpretation of a McKinsey & Co. study that Politifact ruled “false.” Even at eHealth, which has almost no subsidy-eligible customers so far, 51% of clients this year were previously uninsured, up from 34% in late 2013, Lauer said. With 83% of the people using HealthCare.gov and the state exchanges eligible for subsidies, it’s highly unlikely that they’re going to skew more heavily toward the being previously-insured than eHealth’s crowd. Background: With three months of open enrollment completed, Cover Oregon is expanding the enrollment report beyond what is required by the federal Center for Consumer Information & Insurance Oversight to include net private insurance enrollments and also dental enrollments. @charles_gaba @Cripipper no link. I had been asking for the data and I got it the old fashioned way--a phone call. O’Malley points out that despite the problems, Maryland exceeded its overall enrollment goal of 260,000. As of Tuesday night, that number had hit 295,077. It includes people who have enrolled in private plans (which has dramatically lagged expectations) and Medicaid (which has exceeded expectations). ...Sharfstein said in late February that a more accurate projection is 75,000 to 100,000 private enrollees. As of Tuesday evening, there were 63,002, with hundreds or thousands more expected to finish their applications in coming weeks. Paid/Unpaid: Going with 93% "Paid or Will Pay Within a Reasonable TIme"
About 3/4 of the 28K @HealthSourceRI enrollees had paid a premium as of 3/31. People who signed up after 3/23 have until 4/23 to pay. @asymmetricinfo And the paid rate through 3/8 was 83%, including people whose bills were due later. Interim CEO of @MNsure, Scott Leitz, to tell U.S. House subcommittee that 95% of its 47,000 enrollees have paid, and the rate will rise. Read more about Paid/Unpaid: Going with 93% "Paid or Will Pay Within a Reasonable TIme"
In the meantime, I can provide the enrollment figures: 48,150 are fully enrolled in a plan through Vermont Health Connect; 25,930 of those enrolled in Medicaid or Dr. Dynasaur, our CHIP program. Doesn't impact the overall national total, but it does change the dynamic for Vermont to something...rational (prior to this it looked like they had hit a whopping 585% of their year 1 target! This means 22,220 QHPs and 25,930 Medicaid. The Hawaii Health Connector has enrolled 7,861 individuals as of the March 31 deadline, with another 24,176 who completed applications for coverage through the state-run online health insurance exchange. ...It is important to note there are only about 50,000 uninsured people in Hawaii who are not deemed Medicaid eligible, which makes Hawaii’s market small compared to other states. ...Kayla Rosenfeld, spokeswoman for the state Department of Human Services, told PBN on Wednesday that since Oct. 1 — when the department launched its new online eligibility system KOLEA— net Medicaid enrollment in Hawaii has increased by 46,605, which is close to the expected increase of 48,000. Van Pelt highlights the more than 300,000 "enrolled in health care coverage since October thanks to Cover Oregon ... and the Oregon Health Authority." 55,000 people enrolled in private plans using the backup manual processing system set up to cope with the exchange's technology issues. more than 120,000 people enrolled into Oregon Health Plan after the exchange forwarded their information to the state for processing, a workaround for the exchange's broken Medicaid interface. 125,000 people enrolled directly into the Oregon Health Plan using a streamlined system set up to bypass Cover Oregon. Kentucky: REGULAR exchange enrollments extended until 4/11! Gov. Steve Beshear announced Tuesday that the state will extend its deadline. People will be able to file for health insurance from April 4 to April 11. The official deadline had been midnight March 31. Gwenda Bond, spokeswoman for the Cabinet for Health and Family Services, said 21,000 people signed up over the weekend, including 12,000 people who signed up Monday. The deadline affected only those signing up for private health insurance, because those eligible for Medicaid can apply at any time. Because of the high demand, Bond said, state officials decided to add additional days for enrollment or a "special enrollment period." The days between the March 31 deadline and the special enrollment period will allow for some tweaks to the technical system to allow for the extension, she said. Huh. Good for them, but if that's the case, why not just bump this out to 4/15 and be done with it? Weird. Read more about Kentucky: REGULAR exchange enrollments extended until 4/11! So far, 198 companies have bought SHOP policies for 1,770 covered lives — both their employees and their employees’ dependents, Sugden said. That's less than a large state like California, but ahead of other states that have not even been able to launch their small-business exchange, he said. ...The SHOP is attracting about 40 new companies per month right now, a number that will continue to rise because companies can continue to buy policies throughout the year, he said. Update as of 4/1: 41,823 Nevadans confirm Qualified Health Plan Selections through http://t.co/k2YKIcssBl. 25,899 paid to date. Regular followers may recall that a couple of weeks ago, in response to a Glenn Kessler "Fact Checker" article, I ended up converting the "Sub26er" tally from a solid 3.1 million figure (the number touted by Pres. Obama and the HHS Dept. for months) to a "range" setup, similar to the other enrollment figures. Kessler's argument was essentially that the quarterly reports comparing the number of 19-25-year-olds on their parent's plans between 2010 and 2013 fluctuated greatly from one quarter to another, and that therefore instead of taking one particular quarter and measuring it against another (which is where the 3.1M figure came from), it would be more rational to take the averages for the full years and compare those against each other. Based on this, he came up with a range of 2.2M - 2.8M, instead of 3.1M solid. Over the past month or so, several researchers, reporters and other data nerds have inquired about whether I'd be willing to open up the QHP and Medicaid spreadsheet permissions to let people export them to Excel. It was always my intent to do this once the 3/31 deadline was past. However, a few things complicate this. OK, now that we're over the hump of the 3/31 "official" open enrollment deadline, it's time to take a look at the "But how many have PAID???" fuss again. I've been trying to decide whether my "90% either Paid or Unpaid for Legitimate Reasons" rule of thumb seems valid, or whether I should bump it up...or down. An article up in today's National Journal states that according to the Blue Cross Blue Shield Association, their Paid Enrollee figure is around 80 - 85%...for policies from October, November, December and the first half of January. On the one hand, this is significant for two reasons: First, because the BCBSA is huge; I don't know their collective marketshare, but it's big (they include Anthem/WellPoint, the various Blue Cross companies such as Highmark, Regence and so forth). I dunno...maybe 30% or more of the market in total? A few weeks back (upon my request) I was sent updated enrollment data (both on- and off-exchange) from CoOportunity Health, which operates in Iowa and Nebraska. Earlier today (upon my semi-request...that is, I had asked about it a couple of weeks ago but kind of forgot about it), I was sent a press release for Blue Cross Blue Shield of Michigan, which included their ACA Open Enrollment data breakdown (well, most of it...I had to have them clarify the rest). A few minutes ago, without any doing on my part, eHealth Insurance (which I've written about a couple of times for off-exchange data, and which is actually a broker, not an insurance company themselves) tweeted out a link to one of my stories about them. Read more about Michigan: BCBSM: 53K Off-Exchange QHPs, 89K "grandfathered" policies? OK, I don't mean to sound full of myself, and it's a fine article, but it's a bit amusing to see the reporter refer to "politicians and policy makers" as being the only ones who have "largely overlooked" off-exchange enrollments. Millions of newly insured people are hiding in plain sight. They are the people who have bought new health insurance since the start of this year but have chosen for one reason or another to bypass the state and federal exchanges that opened last year under the Affordable Care Act. While the exact number is unknown, some health care experts estimate that it may be in the millions. Politicians and policy makers have focused on the number of people who signed up through the exchanges — at nearly seven million and counting a day after the March 31 deadline — but they have largely overlooked the group that did not use the exchanges, even though it could have a major impact on the program’s financial success in the years ahead. This leads to the main point of this entry. Florida: Extension period pushed out until April 30?? Well this one came out of nowhere...it doesn't seem to be an April Fool's joke. It makes little sense, however...why would FL's be extend to 4/30 when the other 35 Federal-Exchange-run states are all cut off at 4/15? And what's with the April 7th "paper" application bit? Weirdness. The open enrollment period for health insurance coverage for Floridians under the Affordable Care Act is extended through April 30 for people whose paper applications are received by April 7. Read more about Florida: Extension period pushed out until April 30?? Michigan: Oh yeah...Medicaid expansion started here today. And now we enter the Bonus Round! Enrollment began Tuesday for Healthy Michigan, which extends Medicaid eligibility to adults making up to 133 percent of the federal poverty level, or about $16,000 for an individual and $33,000 for a family of four. By 4 p.m. Tuesday, 11,848 applications had been received, and 4,152 had been automatically approved, according to the Department of Community Health. The state expects 320,000 residents to sign up in the first 12 months. The number could grow as high as 470,000 over time. Read more about Michigan: Oh yeah...Medicaid expansion started here today. OK, in addition to the appx. 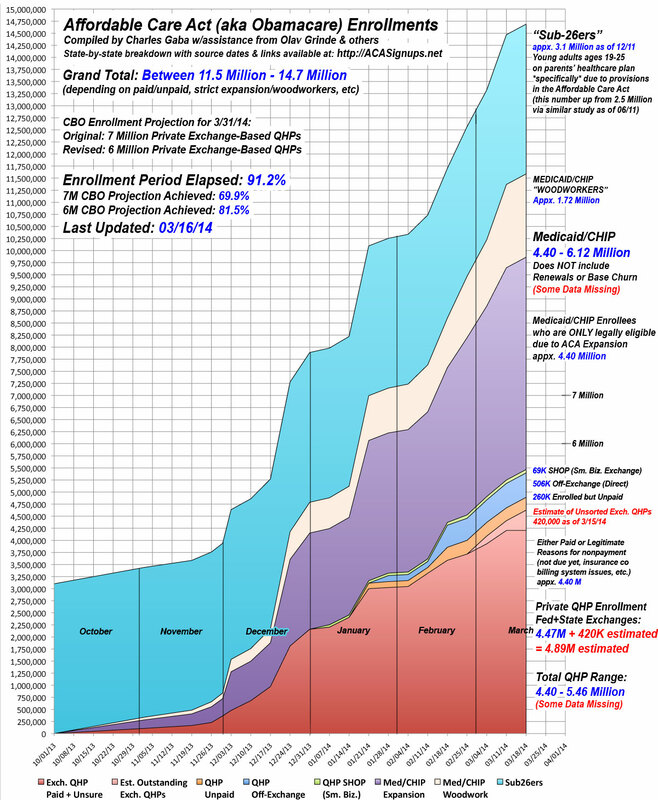 7.041 million enrollments on the Federal exchange (HC.gov), I've brought CO, CT, DC, HI, KY, MD, MN, NY, RI and WA completely up to date, with all QHP data through midnight on 3/31 (some of the Medicaid/CHIP data is still missing, but that's a lesser concern at the moment). I can't tell you how frustrating it is to be this close to full data while still missing it. However, this obviously doesn't apply since the final weekend and especially yesterday were insane. Consumer interest in Covered California has been strong, with 1,209,791 Californians signing up as of 2 a.m. March 31. From March 24 through 2 a.m. March 31, 155,988 individuals signed up for coverage. During the same week, 389,840 accounts were started — including 123,787 on Saturday and Sunday, as consumers hurried to meet the deadline. "Outstanding Numbers" has two meanings: The first, of course, is that in spite of everything--the terrible website launch of HC.gov and some of the state sites; the still-terrible status of some of the state sites even now; the actively-hostile opposition and obstructive actions in certain states, the negative spin on every development by some in the news media--in spite of all of this, over 7 million people nationwide enrolled in private, ACA-compliant healthcare plans between 12:01am on 10/1/13 and 11:59pm on 3/31/14...slightly surpassing the original CBO projection for that period. There's the usual discussions about "But how many have PAID??? ", "But how many were ALREADY INSURED??? ", "How many were YOUNG???" and "What METAL LEVEL did they get???" etc etc etc. All of these are reasonable questions for actuaries, accountants and so forth to ask, and the answers will indeed help shape our understanding of what the overall economic and health impact of the law will be. For the moment, however, none of that matters. This is an outstanding number any way you slice it. Of course, you can quibble about how many of the 9 million off-exchange QHPs were previously uninsured, or how many of the cancelled plans were swapped out with QHPs from the exchanges vs the off-exchange amount. You can quibble about whether the "sub26ers" should be 3.1 million or only 2.5 million. You can argue bout whether "woodworkers" should "count" or not (as if a massive outreach campaign which encourages previously-eligible people to enroll in a program they qualify for isn't an accomplishment to be proud of). You can argue about whether unpaid QHPs should be counted (yet) or not. The bottom line is this: No matter how you slice it, this is a ton of people receiving decent healthcare coverage who either a) didn't have anything before or b) can no longer be dropped, denied or bankrupted by coverage that was scattershot, piecemeal or shoddy. Given the Wyoming Sen. John Barrasso's accusation that the Obama administration is "cooking the books"
New York: QHPs 6K higher than I thought! Since the state website launched on Oct. 1, 826,812 people had signed up for coverage as of 9 a.m. Monday, with 436,304 qualifying for Medicaid and 390,508 obtaining private insurance, she said. Read more about New York: QHPs 6K higher than I thought!